Target training is an exquisite process used to build accurate, detailed, complex or simple behaviours to any animal, but it also needs thoughtfulness and skill to engage safely. 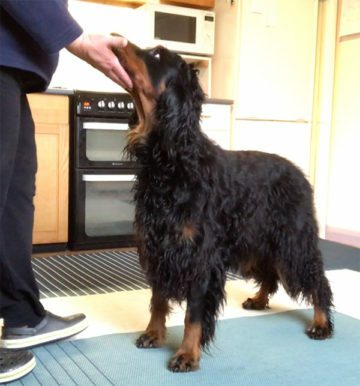 Learning how to teach and use targets as straight forward, unambiguous cues for the dog is at the centre of thoughtful training. We can teach an unlimited amount of targets as each target-object is its own unique cue. You can even screw up teaching a target and start afresh with a new object, you have to love forgiveable training! There is such a rich range of uses for bringing awareness to the dog of their own body, through isolation or immobility or enhanced movement. These behaviours will be build into strong durable actions as the foundation for many other activities: husbandry, grooming, handling, positioning, run to me, run to station, walk, trot and stop, indication targets, the list is endless. Shopping may be involved, or a good rummage in the understair’s cupboard will be necessary. All types of learners, from mice to horses welcome, but there will be lots of videos of dogs. No more space than a kitchen will do. It would be useful for both you and your learner to be familiar with clean food delivery and the use of a marker. Your learner can be of any age and developing lifeskills, preparing for performance, for rehabilitation, for husbandry or simply for the pleasure of interaction and shared quality time. Clean, thoughtful training naturally develops learner confidence, a perpetual joy in learning and strong sense of achievement for both participants.